New Delhi: Stage is set for yet another round of high-decibel debate and confrontation in the Lok Sabha on Thursday on the Muslim Women (Protection of Rights on Marriage) Bill that seeks to put a ban on the practice of instant divorce among Muslims. Minister of State for Parliamentary Affairs Vijay Goel also exuded confidence that the draft law - also called Triple Talaq Bill - will get the nod of both the Houses. "It is an important bill and is aimed at ensuring justice for Muslim women," he said. "The government does not want to do any politics with the Bill. The Ordinance brought this year has addressed some of the issues raised earlier," Mr Goel said. The BJP has issued whip to its Lok Sabha members asking them to be present when Parliament's winter session resumes business on Thursday, December 27 after weekend and Christmas break. The Bill was listed for being taken up by the House of the People last week on December 20 but Congress floor leader Mallikarjun Kharge requested the Speaker Sumitra Mahajan to take up the Bill on December 27 saying his party will participate in the discussions. ''I give you a commitment that we will participate in the discussions on the Bill,'' Mr Kharge said.After Mr Kharge's assurance, Law Minister Ravi Shankar Prasad said he respects Mr Kharge and hoped discussions will take place peacefully on the Bill. Parliamentary Affairs Minister Narendra Singh Tomar also agreed that the Bill will be taken up on December 27. N K Premachandran (RSP) said that he will move statutory resolution against the Bill. While the government will have no issues to get the nod of the Lok Sabha, problems could arise yet again in the Rajya Sabha.Last year too, the Bill was passed by the Lok Sabha but it was stalled in Rajya Sabha. However, in September this year, the government had brought in an Ordinance making the Triple Talaq "illegal". 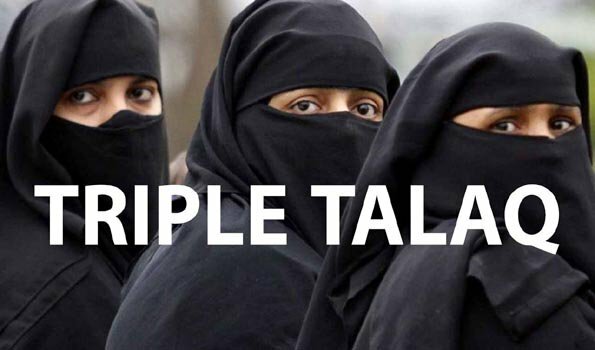 come with the executive order as the issue of Triple Talaq is strictly linked to gender justice. In a landmark verdict, the Supreme Court had found the practice un-Islamic and "arbitrary" and had disagreed that Triple Talaq was an integral part of religious practice. NCP leader Majeed Memon said while it would be easy to pass the Bill in Lok Sabha yet again; problems could be in Rajya Sabha as several opposition parties including the Congress want amendments to it. KTS Tulsi, a senior lawyer and Rajya Sabha member, also said: "BJP should not forget there is a Rajya Sabha".The Bill, which was tabled last week, provides for a three-year jail term for those found guilty of following the practice. It would supersede an earlier Bill that the government had managed to get passed in Lok Sabha in December last year. The fresh Bill was introduced on December 17. Union Law Minister Ravi Shankar Prasad said despite Supreme Court ruling, the evil practice still persisted.Facing resistance in Upper House of Parliament last year, the government has introduced some amendments, but the opposition parties still remained defiant apparently.